Professional dart player Tony Eccles, known as The Viper, has secured a rather unusual sponsorship deal, from the members of internet Darts forum Superstars of Darts. Over 100 members of the popular forum bought shares for £25, raising £3650 before holding three rounds of voting to select their chosen player. Eccles with 46% of the final round vote, topped Remco van Eijden, Paul Nicholson and Chris Mason. 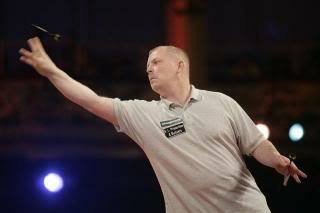 American David Fatum made it to the final dozen along with the likes of Kirk Shepherd, Simon Whitlock, Carlos Rodriguez, Jamie Caven, Alan Tabern, Richie Burnett and Kevin Dowling. Eccles, is an active forum member and currently does not have a major sponsor. On his unique deal he said: “I think that the idea of the forum members clubbing together and sponsoring a dart player is great. With the current economical climate it is extremely difficult to obtain sponsors and so pay the high costs to keep on the PDC tour. I currently am full time professional and without a sponsor I am really struggling. The total cost for entries alone this year is £4000 so even covering part of that is a massive help to a family man like me”. 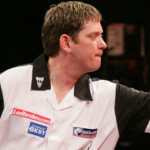 Forum members hope that Eccles, currently ranked 29th in the world, will be able to return to top form which saw him reach the Quarter-Finals of the BDO World Championships in 2007 as well as winning the British Open, before his switch to the rival PDC organization where he competes with the likes of Phil Taylor. Eccles added: “A massive thanks to everyone that voted for me, I will be wearing the badge very proudly and hope to make all the members proud. This means a lot to me and my wife, especially as this is voted, unbelievable”.